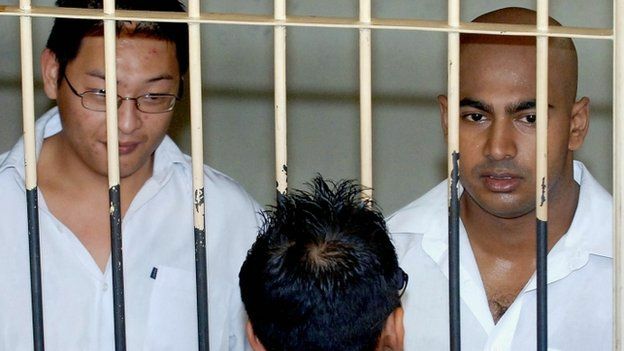 Australia has recalled its ambassador from Indonesia after two Australian men were executed for drug smuggling. Andrew Chan and Myuran Sukumaran were among eight people from several countries executed by firing squad shortly after midnight on Wednesday on the prison island of Nusakambangan. Brazil’s government also expressed its “deep dismay” at the execution of one of its citizens, Rodrigo Gularte. But the execution of a Philippine woman was called off at the last minute. Mary Jane Fiesta Veloso was spared after her government appealed to Indonesia, saying a woman she had accused of planting drugs on her had handed herself in. Australia had mounted a lengthy diplomatic campaign to save Chan and Sukumaran, convicted in 2006 of being the ringleaders of a group of Australian heroin traffickers known as the Bali Nine. Australian Prime Minister Tony Abbott said on Tuesday that the executions were “both cruel and unnecessary,” saying Chan and Sukumaran had been “fully rehabilitated” while in prison. “We respect Indonesia’s sovereignty but we do deplore what’s been done and this cannot be simply business as usual,” he said. Indonesia is an important country to Australia, the BBC’s Jon Donnison says, with the two working closely together on asylum seekers and terrorism issues. This is the first time Australia has recalled an ambassador from Indonesia, and its first ever recall over the execution of one of its citizens abroad. Indonesian Attorney General Muhammad Prasetyo defended the executions, saying his country was fighting a “war” on drugs. Joko Widodo, Indonesia’s president, has publicly declared a war on drugs and said he will refuse all clemency applications from convicted drug traffickers – a stance that could prove legally problematic given that the very point of a presidential clemency is to evaluate each individual on a case-by-case basis. But that will be little comfort to the families of the eight people who were executed. Indonesia risks souring relations with other nations over its hardline approach, as it has already with Australia, home of two of the smugglers. But Indonesia’s new president appears willing to take the risk, even if it means tarnishing his own reputation as a liberal, reform-minded leader. Viewpoints: Are Australia-Indonesia ties at risk? The families of the condemned prisoners paid them final, emotional visits on Monday afternoon before the sentences were carried out. All eight refused offers of blindfolds, and were singing together in their final moments, a pastor present at the execution told the Sydney Morning Herald. Hours after the executions, ambulances left the prison island, taking the prisoners’ bodies to their chosen funeral sites in Indonesia or their home countries. Brazil’s government later issued a statement saying the execution of Gularte marked “a serious event in the relations between the two countries”. Gularte’s family had said he had schizophrenia and should not have been on death row. The statement said Indonesia “had not been sensitive to President [Dilma] Rousseff’s humanitarian plea”. Gularte was the second Brazilian to be executed for drug smuggling in Indonesia in four months. Marco Archer Cardoso Moreira was killed by firing squad at Nusakambangan in January, prompting Brazil to recall its ambassador. But there was delight on Monday for the family of Philippine woman Veloso, after her execution was called off at the last minute following a request by the Philippine president. Her mother described the last minute reprieve as a “miracle”. “We are so happy, I can’t believe it. I can’t believe my child will live,” Celia Veloso told Philippine radio station DZMM. Sonny Coloma, a spokesman for the Philippine president, told the BBC he was “relieved and thankful” but stressed “the death sentence on her has not been lifted”. Hundreds of protesters had been keeping vigil outside the Indonesian embassy in the Philippines awaiting the news. Who were the executed prisoners? A Frenchman also convicted of drug offences, Serge Areski Atlaoui, was originally due to be executed with the group but has an appeal outstanding. The French government said it “reiterates its opposition to the death sentence, in all cases and all circumstances”. It says it takes a hard line because of the country’s own drugs problem – 33 Indonesians die every day as a result of drugs, according to Indonesia’s National Narcotics Agency.